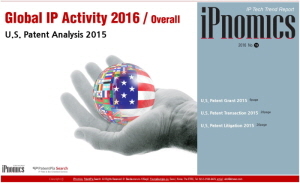 Share the post "South Korea’s Automotive Semiconductor Industries Non-Responsive towards International Standardization Process"
ISO’s (International Organization for Standardization) guideline on production of automotive semiconductors is approaching its final stage. When standards are formally taken effect starting from next year, automotive manufacturers or electronics manufacturers will decide on chip suppliers depending on the guideline and this is type of ‘technical barrier’. However huge South Korean corporations such as Samsung Electronics and SK Hynix and small and medium chip fabless companies are not able to respond to guideline at all due to absence of markets. This is contrast to how semiconductor businesses from the U.S., Europe, and Japan have been deeply participating in formation of guideline and changing entire production process such as product design and verification. Many industries in South Korea are worried that South Korea can become a developing country in automotive semiconductor field. According to Korea Agency for Technology and Standards and Korea Testing Laboratory, working group (WG8) for ISO TC22 (vehicle on road) and SC32 (electric device) decided on most of items for ISO 26262 2nd edition’s FDIS (Final Draft International Standard) at a meeting for international standard for automotive functional safety that was held in Jeju Island from the 6th to the 10th. ISO 26262 is an international standard for functional safety that was established by ISO on the 11th of November in 2011 in order to prevent any accidents that could occur due to errors in automotive electronic components. Safety requirements such as electronic components, software design, analysis, verification and others are laid out from part 1 to part 10 of ISO 26262. If companies do not satisfy these requirements, it is hard for them to supply their components and software to automotive manufacturers. Semiconductor design is newly added to 2nd edition and information regarding semiconductor design is laid out in part 11. 2nd edition of ISO 26262 will officially take effect as international standards in January of next year after going through one more meeting in Germany in July and voting from each country at the end of this year. Cover of a draft of ISO 26262 2nd edition. Guidelines on semiconductor safety design that take 180 pages are laid out in Part 11. “Standards will take effect based on FDIS unless something major comes up and ISO’s official documents will be introduced to public.” said a representative who had participated in standardization process. 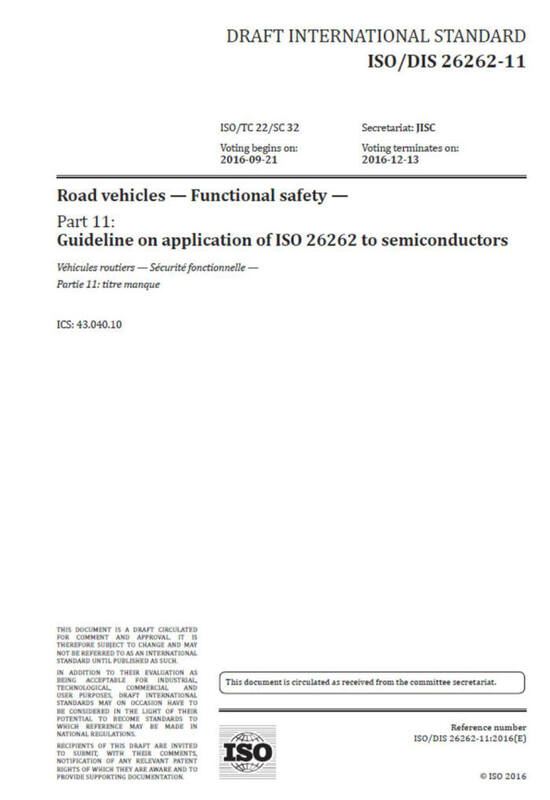 Enormous amount of information that requires 180 pages is written on Part 11 of ISO 26262 that talks about automotive semiconductor safety. Even when Part 1 to Part 10 took effect in the past, South Korea’ automotive and component industries had gone through considerable amount of confusion. Although semiconductors are included as standards based on guideline rather than being mandatory because semiconductors’ design and production steps are more complicated than normal components, there is a high chance that companies that demand automotive semiconductors will select chip suppliers based on whether automotive semiconductor manufacturers can follow these guidelines or not. Main information of Part 11 is regarding abilities to detect errors. Automotive semiconductor manufacturers need to incorporate that can calculate and analyze how much percentage is there that corresponding semiconductors can go wrong depending on chip performance (number of transistors), package type, time, and temperature. Such calculations and others are included in the guidelines. Ways to check malfunctioned semiconductors immediately and to increase safety are also included in Part 11. All types of semiconductors such as digital semiconductors such as memory, CPU, and SoC (System on Chip) and variety of analog semiconductors that are installed within vehicles are applicable to these guidelines. Based on this information, South Korean industries can respond to ASIL (Automotive Safety Integrity Level) that is divided into four levels from A being the lowest to D being the highest. Global automotive manufacturers are requesting ASIL to their major partners after ISO 26262 took effect for the first time. It is heard that ajor semiconductor companies such as Intel, Qualcomm, NVIDIA, Texas Instruments, On Semiconductor, Synopsis, and Renesas have secured significant level of ability to respond as they had been participating in standardization process for the past few years. “South Korea’s major semiconductor companies such as Samsung Electronics did not even participate as an ‘observer’ when guidelines for international standards were being established.” said a representative from this industry. “They do not have any information regarding this and it is also difficult for them to ‘time to market.” A different representative emphasized that although South Korea is the number 1 country in exportation of semiconductors and has great influence towards global markets, its status can be downgraded when a generation of high-tech vehicles opens up. “We are going to actively prepare opportunities that can provide information regarding new international standards to South Korea’s semiconductor industries.” said Kim Dong-ho who is the section chief for Korea Agency for Technology and Standards’ Mechanical Material Standard Department.